This is for 1.75 ounces of wax. 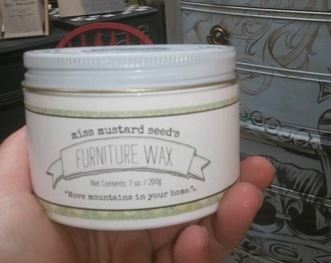 This is the smallest packaged container of Miss Mustard Seed's wax. Marian's furniture wax is a fine museum quality wax based on an old family recipe. It contains beeswax and carnauba wax, and is ideal for use on wood, marble, or as a finish over milk paint. It is easy to apply, provides a durable finish with beautiful luster and has almost no odor. Apply with a clean cotton cloth or an Ultimate Wax Brush. Reference my video on how to apply wax in a thin layer here. Allow to dry for 3-5 minutes. Buff to a shine with a clean lint-free cloth. For additional shine and durability, apply a second coat. Clean brush with soap and water after use. Each tin is 7 oz. or 200g of product, and has a metal screw top lid. Keep in mind- if using multiple Miss Mustard Seed top coats- here is the order permitted OR a cheat sheet , if you will of which are compatible. Treat all top coats as their own entity that should not be intermixed for the exception of the oils/waxes, and even then you need to know which order. Wax is always LAST. 1. Hemp Oil ( waxing over top is allowed and optional.) Tung Oil. Best for Exterior uses, can be applied over Hemp Oil if needed. ( Oil and Oil work together well.) Tough Coat is NOT to be mixed with any other of the top coats in the MMS line, it is incompatible. Use tough coat over milk paint, or bare wood all on its own.